Yesterday I did something completely ridiculous. I went out and bought a cupcake. I bought some champagne. I crafted a candle. And I celebrated my blog turning one. I'm so excited y'all! A year ago I got pissed off at the lack of law-school-focused blogs, so I decided to make one myself. At the time, I didn't think that more than 10 randos would even read my blog, and for a moment there I accidentally abandoned it. 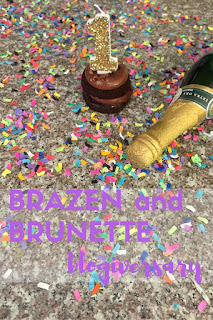 But here we are a year later and I'm so proud of what Brazen and Brunette has become! I've loved getting to message and comment with so many readers and am extremely grateful for this opportunity. 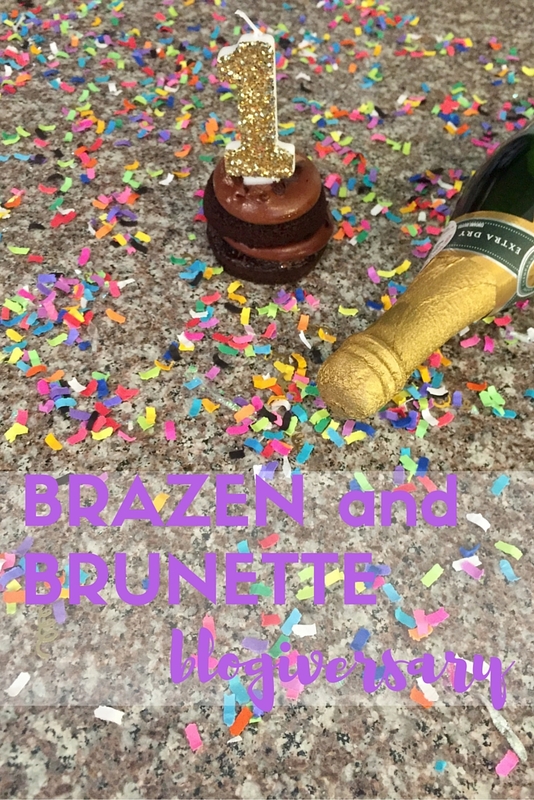 So a lot has changed over the past year, and I wanted to spend this post as a timeout from law school and just give you guys a little update on what's been happening with Brazen and Brunette. The major change was that I completely redesigned my theme. If you were around here back in the beginning, you may remember that it was this God awful orange and green theme, that I had found for free on Pinterest. I grew tired of it very quickly and now I'm very happy with how my blog looks because it's definitely me. Another major change I've made is that I stopped being anonymous. Originally, I wanted to be an anon blogger because I wanted to feel free to share my honest opinions without worrying that it could somehow get me in trouble or negatively reflect on myself. Eventually I realized that I didn't have anything to say that was that bad and it was too much work to try to keep myself a secret. I also didn't like being an anon because I felt as if I wasn't able to share my life with you because I was redacting myself. I also began to feel like being an anon was less Gossip Girl and more Catfish. I'm also happy to announce that my blog has really started to grow, and I'm so excited! It's crazy to me that some of my posts actually have a few thousand views! I'm also really excited that people from around the globe have actually stumbled upon my blog! One thing that I'm proud of is that my blog really started to grow even back when I was an anon and wasn't even active on it. I'm also proud that I reached the 10k mark within a year of blogging, because I'm so new to all this and literally knew nothing at first. Side note: I'm not quite sure why the graph and the stats on the right don't show the same numbers, and I'm also not sure which one is correct. Overall, I'm happy happy happy with the way Brazen and Brunette is going. But one thing that I'd really appreciate from y'all is if you'd go here and "endorse" what you want to see more of! Another thing that I'm excited about is that I'm slowly starting to make money off my blog. I know you hate ads, and I do too on other sites, but a girl's gotta pay off loans somehow and I'm not making any money interning. I just added Google ads to my blog this week, but it's earned $1 already. I know this is pathetically low, but it's still money that I've made just because you guys happened to click on an ad on my page. I'm hoping that this time next year I can laugh at the fact that I had only made a buck. I've also became an Amazon affiliate member this summer, and have made about $25 from that. That comes from any item you buy on Amazon if my site referred you or signing up for free trials such as Amazon Prime student, Amazon Kindle, and Amazon Prime Video. I'm not sharing these numbers to come off as bragging, but simply so that I can be honest with y'all about referral fees that I collect when you visit a website or sign up for something that I've recommended. Of course, I've also spent my own money on my blog. I finally decided to commit to paying $12 a year to drop ".blogspot" from my website, which I feel like helped it become a little more like a serious blog. And I spend about $10 getting a blog theme off Etsy (the shop that I got mine from is currently closed but here's another shop that I love). Right now I'm also contemplating promoting my blog on Facebook, Pinterest, or through Google, so that could be another expense later on. Unfortunately for law students, having a successful blog isn't exactly something that could boost our résumé and help us get a job like a PR, computer science, or English major. But blogging can still be a great thing to start up in law school. One highlight of it is that it can be a great way to memorialize your short three years in law school. I loved being able to look back at this past year and remember how clueless I used to be and watching myself figure things out along the way. Part of this is because blogging makes you pay closer attention to what's going on in your every day. When I was going through a something new, I didn't just passively experience it, but rather tried my hardest to remember everything that was going on so I could write about it and explain it to y'all. Another perk of blogging in law school is that it's a place to receive some validation. Every time I get an email or comment with someone telling me they love my blog, I get giddy inside and tbh sometimes I'll screenshot a little of what you say and send it to my friends to brag. I also really love it when someone gets in touch with me and lets me know that one of my posts helped them have a little less worry or feel prepared for some aspect of law school. It really does give me this feel-good feeling to help y'all similar to what I get when I'm volunteering. Probably the way that this blog has helped me the most in law school was that it was an anchor for me. When law school got boring, I had this to be excited about. When I felt like giving up, I remembered that I had to keep going so that I could have something to write about. When I felt like I wasn't good enough, I'd receive a kind email or comment reminding me that law school is where I belong. And if I had time to get good grades, run this blog, and still binge watch on Netflix, then you can too! I get so excited when one of my readers lets me know that they're starting a blog or planning to, so I'm planning on my next few posts being about my tips and advice for y'all. 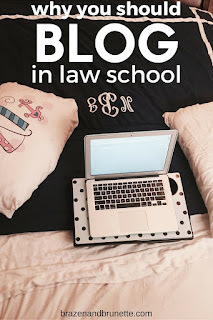 Because I seriously think that the world could use a whole lot more law school bloggers out there!! It's ridiculous that there's hundreds of very successful college bloggers out there, but law school bloggers are much harder to find. Seriously though, I think everyone should consider blogging through law school. 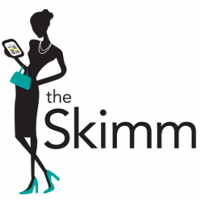 I love your blog and am thrilled when I wake up to an email alerting me of a new post! I'm 39, 3 kiddos and a hubby and starting law school in a few short weeks! Eek. I finished my undergrad (did it while working full time) this past June and took the summer off from stockbrokering to refresh. I have been reading your blog since almost it's beginning and it's helped me so much in navigating thus far and knowing what to expect. I love writing and have really been considering doing a blog. You have been my "go to" for blogs since there are few out there. Maybe a law school blog with hints of managing with a family? Trying to cook for 5 after a long day? When budgeting, do I keep the yard guy or have one less date night a month? :) Thank you for sharing your experiences and advice. Well done! Lindsey I definitely think you should blog about your law school experience! There was actually quite a few people who were married with kids in my section so I know there's an audience that could benefit from what you have to say! Thanks for the encouragement! I'm definitely inspired to write a blog. I don't think it has to include too much family and kids but I think it might be helpful to some. I've enjoyed reading a variety of things to help me prepare. I looooove my Plum Paper planner, thanks to your research, and I'm sporting the amazing set of highlighters you suggested. Thanks again! Yeah I mean I really started this not knowing what I'd write about and just kinda was all over the place at the beginning. One thing to keep in mind is your most popular posts and figure out what makes them popular and then try to build off them. I started using Bloglovin and follow all kinds of blogs for inspiration so you definitely don't have to limit yourself to one niche. Good luck with law school this fall and definitely send me your link when you get your blog up and running!! Congrats on your blogiversary!!! I love how serious you take your blogging and I wish you had been around before I started law school. It has so many tips and pieces of advice. I'm about to start my 3L year so I'm not sure if I will continue my blog after the bar exam but I definitely agree with all your reasons to start a blog. Besides, it is FUN! Well I have another year to decide but honestly, your blog is so much more put together than mine. You should find a way to continue it! I like my blog but it's not my passion. So we shall see. I have been reading your blog since the beginning and I absolutely love it! I start my 1L year on Monday. I'm seriously thinking about starting my own blog but I'm having trouble coming up with a name. How did you think of yours? Tbh Kassie, I just decided on a whim that I wanted my blog name to have brunette in the title for no reason at all. Then I knew I wanted it to be an alliteration so I just said there and went bruh...bra... and eventually thought of brazen. What's a pure coincidence is that brazen is defined as "endure an embarrassing or difficult situation by behaving with apparent confidence and lack of shame" which is exactly how I felt blogging about having to go to my backup school after being waitlisted. I know that's not a particularly useful story, but my suggestion to you would be to just make a blog (even if it's just called Test Blog). Start working on your first few posts and save them as drafts. While you're fine tuning them, keep thinking for a name and then when you find the perfect one you can rename your blog. But don't think you have to wait to publish your posts until you have a perfect name, because you can always rename your blog later as many times as you want!